Grosjean made a difficult entrance into Formula One in 2011, littering his first full season in the sport with first lap crashes, retirements, and a one race ban. Having learnt his lesson and worked hard over the winter, he was re-signed to Lotus for a second year, and repaid their faith with podiums and trophies. He aimed for more success in 2014 but the car underperformed, leaving Romain vocal about his frustrations. The Frenchman joined the brand new Haas F1 team for 2016 and beyond. Romain Grosjean made his single seater debut in the Formula Renault series, moving through the variations in Europe until he made the step up to Formula Three. He was initially given a one-off drive to substitute another driver, but took part in the F3 Euroseries in 2006 for a full season.Over the next couple of years, he started to pick up pole positions and wins, and finally won a title in 2007 over Sébastien Buemi. The GP2 series was next, with Grosjean participating and winning the first GP2 Asia championship and then a full season for the ART Grand Prix team in 2008. His links with Renault helped him move into Formula One, becoming a test driver for the works team that same year. He participated in a demonstration at the World Series by Renault, and then the following season was promoted to a race seat. The move came halfway through 2009 when Nelson Piquet made a swift and controversial exit. Grosjean made his F1 debut at the European Grand Prix but had a difficult half season – littered with retirements and collisions. Renault replaced Grosjean for the 2010 season, and so the Frenchman looked around for other opportunities. He helped tyre supplier Pirelli with some testing duties, and drove in the GT1 World Championship, as well as the 24 Hours of Le Mans. He retired from the race, however. In 2011, Grosjean returned to the comfort of the GP2 Series and won both the Asia and main championships that year. The success put him back in the frame for a Renault seat, and the team, now called Lotus-Renault, re-hired Grosjean for the 2012 season. His first full year in F1 featured a massive learning curve, and Grosjean was repeatedly criticised for his tendency to cause or be involved in first-lap accidents. As the number of incidents continued to rise, the stewards finally took note and banned Romain from one race, the Italian Grand Prix. Having sat out the event, Romain was convinced he had learned his lesson, although was still involved in several incidents throughout the rest of the season. Speculation was rife over whether he would be able to retain his seat with the Lotus team for 2013. Being managed by the team principal, Éric Boullier, helped the situation, as did winning the Race of Champions competition over the winter. Grosjean also worked with a sports psychologist to improve his performance, and it was finally confirmed just before Christmas that Grosjean would stay at Lotus for another season. In 2013, Grosjean drove a much improved season, although he struggled at Monaco crashing in most of the sessions. That aside, he finished on the podium several times, picked up a handful of trophies, and challenged his far more experienced Kimi Räikkönen in both qualifying and races. Having shown the rate of improvement over the course of the year, Lotus wasted no time in announcing Grosjean for his third full season in 2014. Sadly, the performance gains seen in 2013 were completely lost the following year and Lotus endured one of their worst seasons to date. Two eighth places were the highlight of the season, and by Singapore, Grosjean was airing his frustrations with the state of the Renault engine powering the car. Despite his concerns, he remained with Lotus for 2015, hoping to improve on the previous year and regain his 2013 form. The car performed slightly better, but it was still not enough for the Frenchman. He signed for the new Haas F1 Team for 2016, joining Esteban Gutiérrez for the team's debut season. Haas enjoyed a strong start to the season but drifted backwards as the year unfolded, developing several technical problems particularly to do with the brakes. Despite being vocal about his frustrations with the mechanical troubles, Grosjean seemed to fit well with the team, and remained positive about the 2017 season. 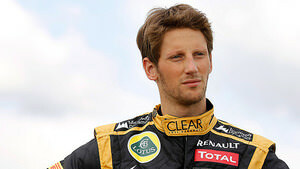 Learn more about Romain Grosjean with the Pocket F1 Handbook. Pierre Gasly makes a tasty move on Romain Grosjean, who takes a look but can't do anything. He loses momentum and Felipe Massa also moves past the Haas. Turn 1 incident involving Romain Grosjean and Fernando Alonso noted - no investigation necessary. 5 second time penalty for Romain Grosjean - leaving the track and gaining an advantage. Turn 14 incident involving Romain Grosjean under investigation - leaving the track and gaining an advantage. Romain Grosjean has pushed Felipe Massa out of the top ten, moving past him for the final points position. A heartstopping overtake by the other Haas puts Magnussen ahead of Ocon for 12th. Team radio from Romain Grosjean: "Mate, the visibility is terrible back there." Turn 1 incident involving Romain Grosjean and Max Verstappen - no investigation necessary. Turn 1 incident involving Romain Grosjean and Max Verstappen noted. Max Verstappen outguns Romain Grosjean to overtake the Haas, but it's all for 19th position after their early pit stops. Team radio to Romain Grosjean: "The end plate was broken on that wing, so you were correct to change the wing."